and his ex-wife, Lenore (Famke Janssen). The happy reunion turns sour when Lenore is taken by people working for Murad Hoxha..."
Taken "is a 2008 French thriller film produced by Luc Besson, starring Liam Neeson, Maggie Grace and Famke Janssen. The screenplay was written by Besson and Robert Mark Kamen, and directed by Pierre Morel. 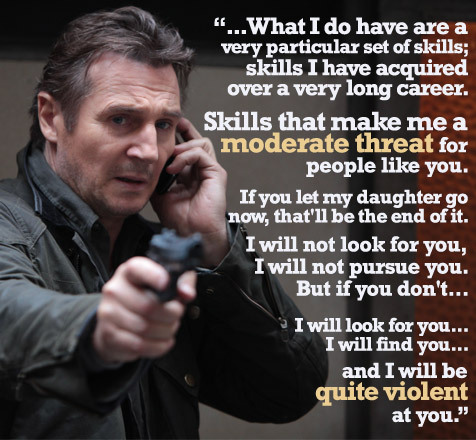 Neeson plays a former Central Intelligence Agency (CIA) operative who sets about tracking down his daughter after she is kidnapped by human traffickers while traveling in France."